Victor Hugo is probably most well known for being the author of Les Miserables, though The Hunchback of Notre Dame is a pretty famous title, too. But in France, he is much more of a huge deal than that. Not only did he write many more things and was acclaimed as a great author during his lifetime, he was also an enormous cultural and political influencer of his time. Of course, as usual, Wikipedia has all the details. For instance, it was actually his novel that turned Notre Dame into the tourist attraction it is today, and the swelling numbers of those first visitors is what got the structure repaired and maintained. It was in quite the state of disrepair at that time. 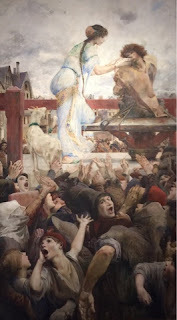 The novel was also the inspiration for at least one painting, which is now hanging in the building that was his home. He was also a fierce advocate for copyright law, which was not actually a thing when he began writing. And though that was one of the first issues he fought strongly for, there were enough others he cared about that he finally ran for office, and was elected. Though he was not as successful in politics in the latter part of his life as when he first became involved, Victor Hugo definitely had a significant and long lasting impact on France. So a street where he lived was named after him, and his home is testament to his importance. 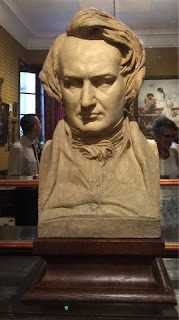 There are busts and paintings of him. 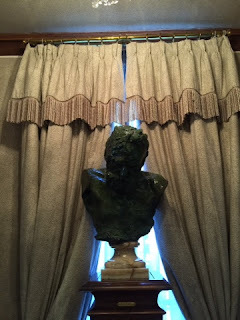 One of the busts is by Rodin, but it is set in front of a window, so much of the detail is lost in this photo. There is a painting of him and his son. And still creepy to have someone sitting there drawing, or painting, as people came to pay their respects. 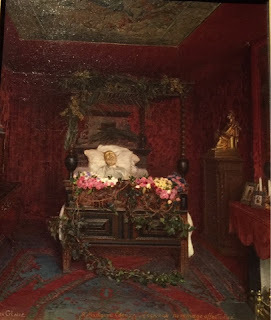 And look, another painting of him in bed, hanging above the chests. Dead or Alive? And regardless of which, just how many people did they let in there with sketchpads? The room is not that big, trust me. The whole house was not available to the public, just the main rooms. An anteroom, a couple of parlors, the dining room and his bedroom. A smaller room, probably a study, was under repair when I went. And it was not entirely furnished as it was during his lifetime. The bedroom and dining room looked the most intact, but the others were just used to hold pictures and other decor items that were presumably brought in from the rest of the house. 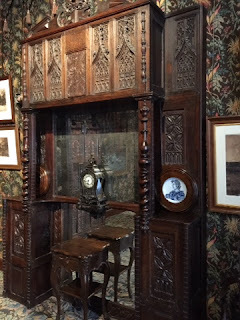 There was one room that held so many different prints and patterns, I would be surprised to find that they had always lived together. 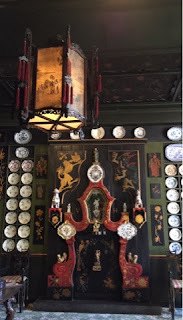 On the other hand, the dining room was a riot of pattern that was clearly all put together on purpose. So I could be wrong about the other room. It did have some very nice pieces of furniture in it, though. 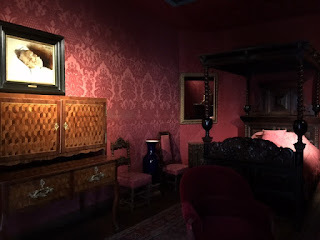 And I did like his bedroom, all done up in red, also with exquisite pieces of furniture. And I liked the stairwell, it's not a size I've seen before. There are the magnificent ones in palaces and stately houses, and the cramped to claustrophobic ones we see in normal family houses. So this must be what the staircase is like in a well off, but not aristocratic, home. I would have preferred seeing at least another floor or two, but all in all, I did enjoy seeing what I found there. Plus, it is right on the Place de Vosges, which is a nice garden square. And the weather was beautiful, so it was a very nice place to visit. 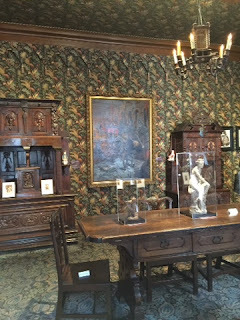 Also, it's free to see the home, even when there are temporary exhibitions that require admission fees. So I think it's well worth a visit. I love that so many of the museums in Europe are free or cost very little. There are so many things to see, it's nice to be able to do so cheaply. 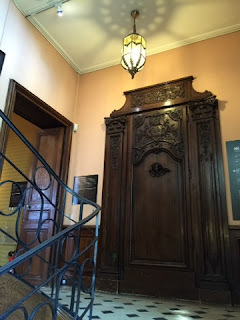 There is another one in Paris that was free, the Carnavalet. It was one of my absolute favorites, and will get its own post soon. In the meantime, I just realized that I never posted about my visit to Bath, which is a very close second to Paris as my favorite happy place. So that's coming up next.